From Rachel Ray (saving my marriage) to America’s Test Kitchen, I’ve been in a cooking mood this week at MommaSaid. So I’m going to give away something that will help you cook whether you’re a gourmet chef or a reheat-the-pizza kind of person. 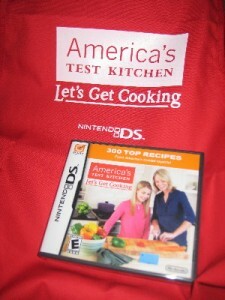 America’s Test Kitchen: Let’s Get Cooking for the Nintendo DS and a red apron. (You need a DS system to use it.) Rated E for everyone. Retail value of the game is $19.99. Everyone involved in the cooking process can rate favorite recipes. When you’re looking for a family favorite in the future, a search function makes retrieval easy. Users can find something for every taste and occasion by browsing the 300 recipes by ingredients, difficulty, cooking time or even calorie count. If the cooks in your party don’t know a marinade from a marmalade, prompts appear within recipes for specific terms that they might need more information about. Users can then watch helpful how-to videos to show them what to do. Users also can hear audible instructions and use voice commands to navigate the software during the cooking process. If multiple people on your cooking team have Nintendo DS systems, you can wirelessly transmit select recipes to them, even if they don’t have a copy of the game card. That lets you concentrate on the entrée while your assistants tackle the side dishes. Just as with a traditional cookbook, users can take notes. The software’s handwriting-recognition feature records notes about personal touches users add to their recipes. All the recipes have been created by editors, food scientists, tasters and cookware specialists at America’s Test Kitchen. They’ve taken the guesswork out of finding the best recipes, which leaves you and your assistant chefs to focus on the fun of cooking. Leave a comment under this blog telling us how feel about cooking — love it, hate it, don’t feel one way or the another about it — and why. Winners will be selected at random by Random.org. Monday, March 29th at noon ET. Note: MommaSaid received this game and the apron from Nintendo and decided to give it away. We also got a Nintendo DSI XL and another really cool game called Wario Ware: DIY, but my son has spent his past two sick days creating his own video games with those and I plan to post something about them soon. Random.org picked #12, so Nicole (SAHM Reviews) is our winner! Thanks for playing. See you all Friday for the next Freebie giveaway. I love to cook – so to learn new recipes by using the DS sounds really cool!! Thanks for the chance to win! It’s great for bonding and it’s an art. I love food and hope to be a master chef. I love cooking but I’m not very good at it and horrible about planning. I would love to be creative and come up with fancy dishes with whatever is in the pantry but I just don’t have what it takes. And it doesn’t seem like something I can learn… either you have it or you don’t. I love the idea of cooking…but often find myself lost for ideas for dinner. Sometimes I get creative…but recipes are almost always a must for me. I love to cook, I am currently going back to school for it thats how much I love it. I hope to one day open my own B&B and make other people happy if not through their belly then with kindness and hospitality. My husband LOVES to cook and I love to bake! It works out nicely in our house…my husband would be thrilled to win this great prize. My kids like to help out in the kitchen too and we all watch Food Network very often. good luck everyone! I love to eat, particularly “fancy” food but I hate, hate, haaaaaaaaate to cook. I need a personal chef. If I win, I will be giving everything to my almost 7 year old. He LOVES to cook. He can (with stove supervision) make his own eggs and he helps me with lots of stuff. We snuggle on the couch and watch ATK and the old Julia Child episodes still shown on PBS! I love to cook and am really enjoying passing my enthusiasm on to my son. Cooking is something I HAVE to do…sometimes I do actually enjoy it. My husband really enjoys cooking for relaxation. He has taught our son to cook & his first Boy Scout merit badge was “Cooking!”. Our son has also considered becoming a chef!! Hey Jen! I have been in the ‘experimental’ mood lately w/ cooking. (much to my kids dismay). T I have fun w/ the experiments and adapting them to the kid’s allergies… some work (turkey meatballs were a big hit on pasta night), and some on’t (the ‘orange chicken’ was a little to orange-y for the kids liking)…. I love baking. Cooking … well, it depends on how hungry I am! I love to cook most of all when I am just throwing things together! Following recipes can make me crazy! I have learned that if I like all of the flavors that I put in the pot, then it should turn out great… If not just add cheese!